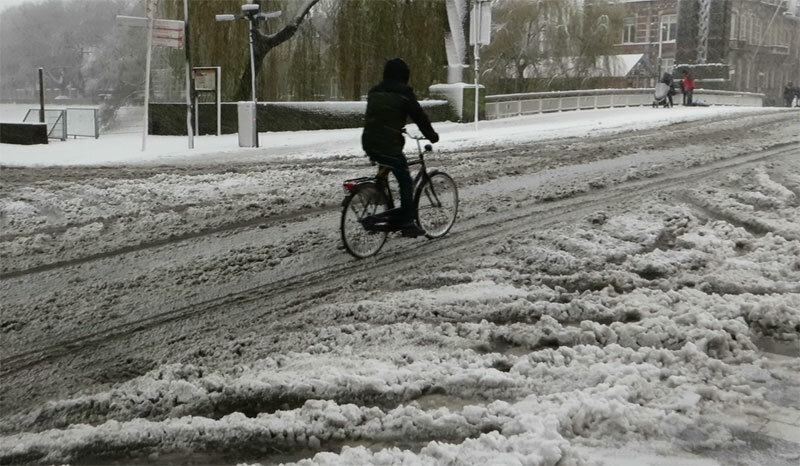 Last week you could see my presentation at the Winter Cycling Congress in Leeuwarden, from 10 to 12 February last. In my post this week, I’d like to show you a bit more about that event. A great video was made to give a quick overview of the entire congress, so why don’t we start with that video. Winter Cycling Congress 2015 video (not mine!) The still shows Mikael Colville-Andersen of Copenhagenize. Participants from all over the world had come to the capital of “Freeze land” (Friesland/Fryslân) to find almost no winter at all. I spoke in four languages with people from the US, Canada, Finland, Sweden, Denmark, Austria, Kazakhstan, Belgium, France and Germany. But there where people from a lot of other countries too. 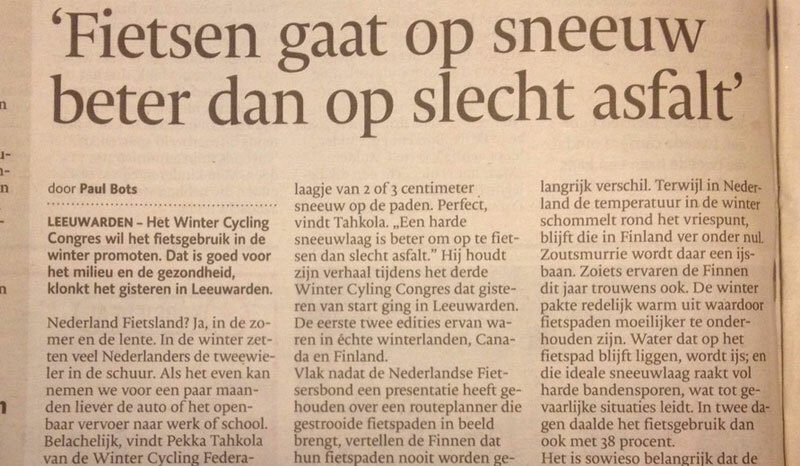 News paper article about the Winter Cycling Congress in the paper edition of Brabants Dagblad. Pekka and some other people from Finland taught me a new word: “Snow-how”. Which makes a lot of sense, because that’s what you need if you want to keep Finland accessible in Winter! Just look at this video of the snow clearing in Oulu! “Snirt” in ʼs-Hertogenbosch. From the video of this post. One of the other keynote speakers, Tom Babin, writer for the Calgary Herald and author of the book Frostbike, also taught me a new word: “snirt”. Of course I already knew what it is – snow that’s messed up and that has gotten dirty because of motor traffic – but I had never thought that stuff needed a word. I have learned other things too. Winter comes in many shapes around the world. It makes a lot of difference to road maintenance and snow clearing if winter means temperatures of below freezing point for many months like in Oulu, or when the temperatures go below and over that point all the time, like in the Netherlands. But, to my surprise, that happens also in Helsinki and even Calgary, because of their hot Chinook winds. Dealing with melting snow, that may also quickly freeze over again, is one of the harder things for winter maintenance. 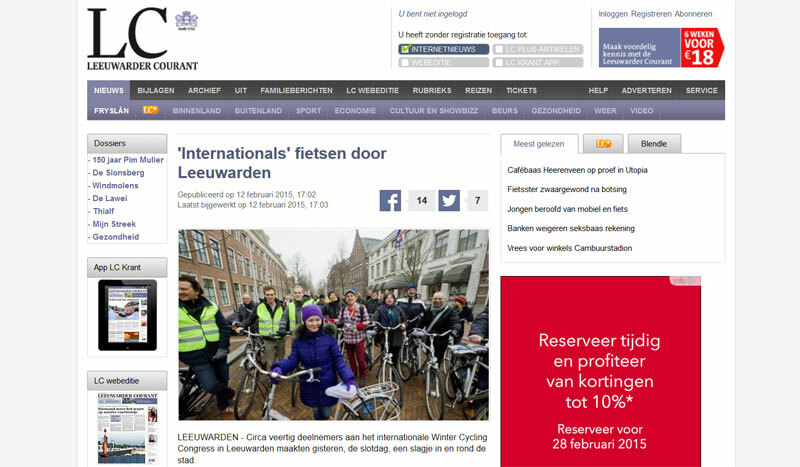 The Leeuwarder Courant (the local newspaper) wrote about the cycle tour in Leeuwarden by some “internationals”. 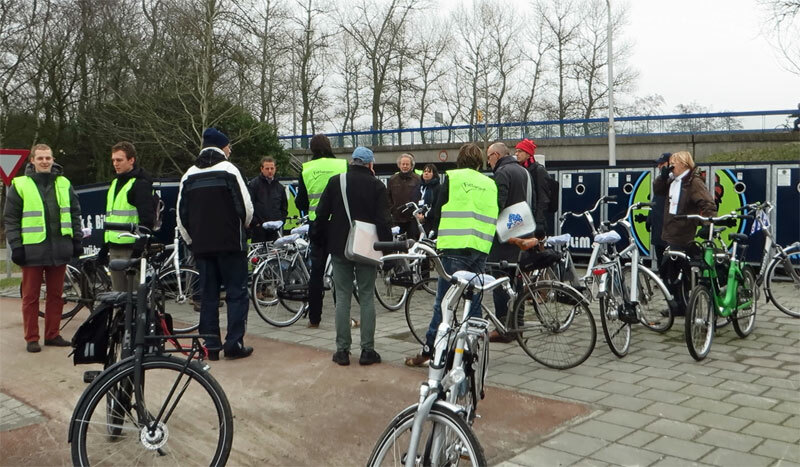 It was great to see foreign visitors experiencing cycling in the Netherlands for the first time. But since they were mainly in the car free old city centre, it was very good that a cycle tour was organised for them. Because that made it possible to experience the excellent cycling infrastructure in areas of the city that are far more recent and to which people from other countries can much better relate. The cycle tour started at the main building of the provincial government and took the participants to some highlights in the city and even outside the city. My video gives an idea about what they experienced. You will see things I have shown you before from other cities and I think it is good to know that cycling is wide-spread in the Netherlands. There are many cities with a very healthy cycling climate that you may have never heard of and that I haven’t shown you either. Leeuwarden has a few specific examples of how to make cycling an attractive alternative to driving a car, that I will now write a bit more about. My video of the cycle tour in Leeuwarden (please turn on subtitles in English if you have trouble understanding everything that is said). The first of these examples is the “Park & Bike” facility at Goutum, a small former village, that is now part of the Leeuwarden municipality. We all know “Park and Ride” facilities for car sharing, but this is different. The facility was developed by the city council, together with larger companies with a lot of employees, to get to a “more clever mobility”. The goal was to reduce car mobility by 5%, because that would already ease congestion. Employees were given the chance to apply for a parking spot at the edge of the city, that comes with a locker with a bicycle at no cost for them. They would arrive from their further away homes at the edge of Leeuwarden in the morning and park their car at that designated parking spot. They have a pass to open any of the lockers to take an available bike to go to their work place in the city, all the while riding past the lined up cars in the morning rush hour on your dedicated cycle track. Now who wouldn’t want that? The facility started in 2011 with 30 parking spots/bikes, but has in 2014 been expanded to 50 bicycles, because there was a waiting list. 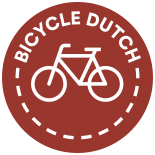 The city of Leeuwarden is now looking for other locations for more Park & Bike facilities for people arriving to the city from other directions. The tour stopped in front of the bike-lockers at the Park & Bike facility in Leeuwarden, Goutum. The Drachtsterplein intersection was a typical large intersection at the edge of the city, that was built in 1971. 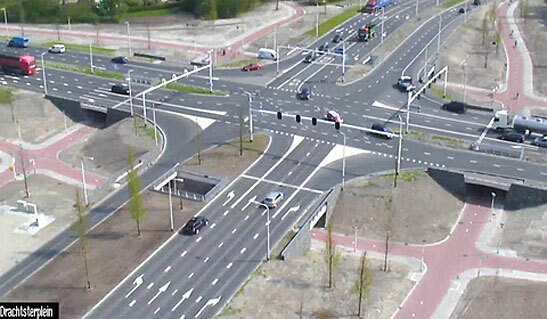 At that time, intersections like these were built in many locations in the Netherlands. I’ve shown you one in Utrecht that looks a bit similar, but I have also shown you two examples that were since reconstructed. One again in Utrecht and the other is the famous Hovenring in Eindhoven. The Drachtsterplein instersection as it existed between 1971 and 2011. The intersection in Leeuwarden was also reconstructed. In 2011 the traffic circle was closed and a temporary wider traffic circle led traffic around the building site. There, an elevated large four-arm cross roads was constructed. Now that the intersection was raised about 2 meters, the new cycleways had to be lowered only slightly, to go under the four approach roads. Wide and light tunnels take people cycling under those roads. There were many level crossings with traffic lights in the old situation. Motor traffic kept its lights, but people cycling can now pass this intersection at speed, without any interaction with that motor traffic and without any traffic lights. Drachtsterplein shortly after the reconstruction was completed in February 2013. The reconstruction is part of a much larger reconstruction of the major roads around Leeuwarden. Through traffic is diverted around the city, to make the living environment in the city better. The new Drachtsterplein was opened in February 2013. It has cost 7.5 million Euro to make this intersection so attractive for people cycling. You can see a time lapse, that shows it can also handle a lot of motor traffic. 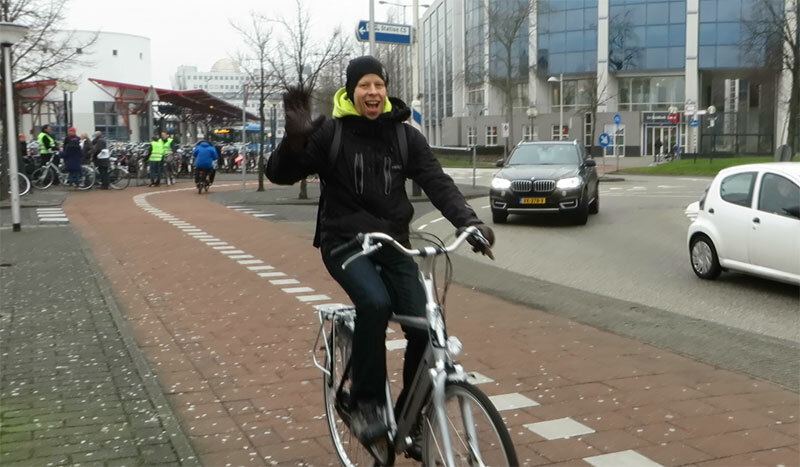 Timo Perälä, President of the Winter Cycling Federation enjoys the cycle tour in Leeuwarden. This was in front of the Central Railway Station where there is an older cycle path with tiles. The next Winter Cycling Congress 2016 will be held in the Twin Cities of Minneapolis and Saint Paul in the United States. Drachtsterplein. It appears that the new 4-way intersection takes up less space than the traffic circle it replaced. What is the city now doing with the reclaimed space? Bike & Park in Goutum. 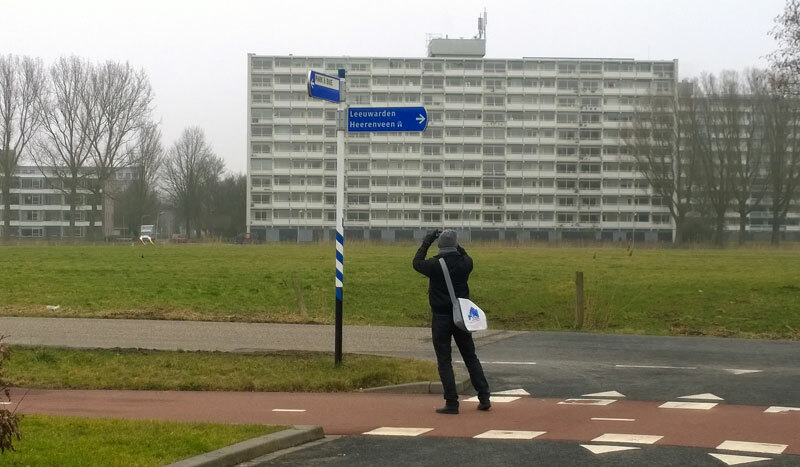 Is there transit access to this facility, or between the facility and Leeuwarden? I think they planted a lot of new trees around Drachtsterplein but no other developments, just the park extended. I don’t think there was any public transport access at the Park & Bike facility. It really was right at the freeway exit for people arriving by car. But there may be a bus stop nearby that I missed. There are actually less trees now then there used to be. 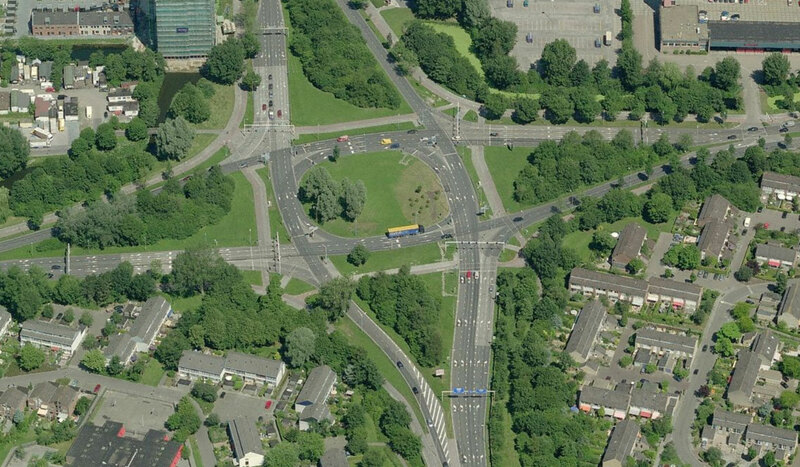 But yes, the space around the junction is mostly green. There is also a new water way aside the junction now. This will be connected to the canal, creating a new route for small boats. There is a bus stop on top of the bridge near the Park & Bike facility, but only to go out of the city. The bus stop to go into the city is further away. English, Dutch… what are the other two languages that you speak? Being a Canadian for me I speak English and French. And a smattering of Dutch that I picked up when I was in The Netherlands while serving in the Canadian army. I don’t think Danish is on that list. Or Scottish Gaelic. Though I think you can speak and read decent Frisian due to its mutual intelligibility with Dutch. Same with Afrikaans. This entry was posted on 3 March 2015 by Bicycle Dutch in Original posts and tagged junction design, Leeuwarden, ride, Winter.